A spunky, contemporary novel about friendship, failure, and what happens when things don’t go according to plan, ideal for readers who like their heroines smart and strong—but not perfect. Nominated for Best Young Adult Novel by the 2017 RT Reviewers' Choice Awards! Danielle's plans for the future were all figured out... until she failed senior English and her single college acceptance was rescinded. Determined to get her life back on track, Danielle enrolls in her hometown community college with a plan: pass English and get back into Ohio State—and her mother’s good graces. Romance isn't on her radar... until she reconnects with her childhood crush and golden boy next door, Luke. Between family drama, first love and finding her own way, Danielle can't help but feel a little overwhelmed. Thankfully she has her friendship with the snarky and frustratingly attractive Porter, her coworker at the campus bookstore, to push her to experience new things and help keep her afloat. One thing's for sure: This time, failure's not an option. 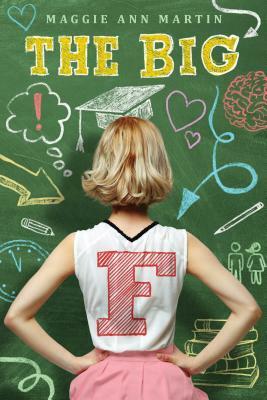 Chosen by readers like you for Macmillan's young adult imprint Swoon Reads, The Big F is a smart, funny, and highly relatable novel by debut author Maggie Ann Martin about finding your own way after one epic fail. Maggie Ann Martin, author of The Big F and To Be Honest, hails from Des Moines, Iowa but moonlights as a New Yorker. She earned her BA in English and Journalism from the University of Iowa, the most welcoming literary community in the world. When she is not writing, you can find her binge-watching TV shows or passionately fangirling over fictional characters on the Internet.